Traders Academy Club Review | Be a Winner In FOREX !!! Interested in earning thru Forex Trading but you fear that it is too risky and you might lose a lot of money? Are you a beginner or already are doing trading? Well, if you want to know more about trading here is a program that promises all the things you need to know and be an expert in Forex Trading. Vladimir promises to provide Forex Trading to everyone and without paying a lot of money? But is it Legit? Or is it another scam? Do not worry because I am here to help you out. I want to make sure you will get all the information you need for you to decide if you want to invest in this or not. Although I am not a member of Traders Academy Club, I did complete research on the things you should know and consider in this club. Currently, I am happy with what I am using right now. 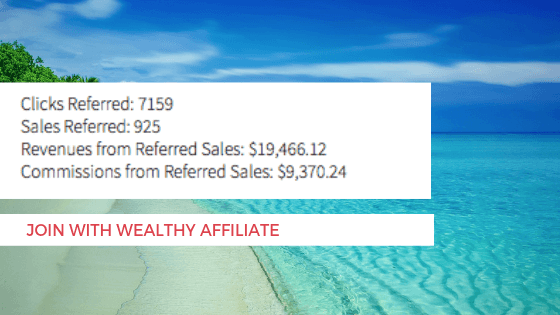 An all in one platform where I am earning my 4 digits monthly passive income thru Affiliate Marketing. Nevertheless, here is my Traders Academy Club Review! 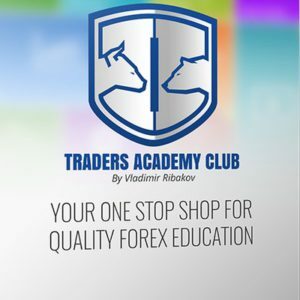 Trader’s Academy Club is one of the best online program created by Vladimir Ribakov for Forex Trading. Designed By Vladimir, the lesson and program it will not only provide you the basics of Forex Trading but will also give you knowledge more than the traditional Forex Trading. It is also designed to help beginners and increase the knowledge of those who are already in the trading business. To make sure that everyone will benefit from the resources of the club. The format is not like the usual training which I will discuss in a bit and a lot of people gained a lot of knowledge from them. Feedbacks include having comprehensive and in-depth training and resources about Forex Trading. Vladimir has more than 12 years of experience with forex trading and is also a professional trader and mentor. He is also well known in the world of Forex Trading. 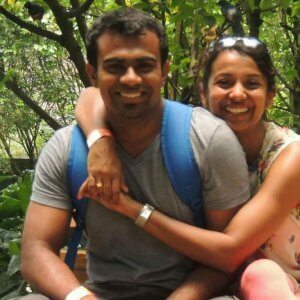 His passion for trading made him created an online program to share his knowledge and to get in touch with people that have the same passion as him. He only has two goals for this program: To share his knowledge and to make it affordable for everyone to know forex trading. He also developed a lot of trading software listed on his site. Aside from that, you can check all his information on his website to also see his accomplishments and his involvement in the Forex Community. Not only is he know for Forex Trading he also handled hedge funds and brokerage accounts. With his name and his expertise with Forex Trading, there’s no reason for you to not trust him and his methods to Forex Trading. This is also one of the reasons why other traders trust him and are willing to connect with the club to provide further knowledge and expertise. What’s inside Traders Academy Club? This occurs every weekend and is 30 to 50 mins long. Time Zones will be European and American. Every live training will include trade recommendations and the mechanics behind each and every trade. Instead of only learning how to buy and sell, you will know the analysis behind every signal until you master it on your own. If for some instances you missed the webinar you will be able to go back to it as it is saved under Media Zone. Stored webinars will be together with 2,000+ trading videos that you won’t find anywhere else. Their tools and references are for both beginners and for experts. They can choose from their thousands of trading videos. They also have beginner’s guides, trading tools, ebooks, and you can connect with their live support 24/7. A member you will get full access to all their trading products. Now, if you are already an expert you can consider this as additional knowledge since you will also get access to their hundreds of detailed reports that show profitable trades and explain how to identify similar setups in the market. Trade room sessions are also available every day where you can ask Vladimir any question. They have an interactive and like-minded community where you can discuss topics with each member. You can chat members in live chat rooms and Telegram Groups. Aside from that, you can also contact Vladimir if you have questions. 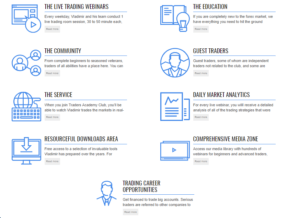 Independent traders not related to the program and some veteran club students that have succeeded to become profitable traders are being invited to their Live Trade Room Sessions or Webinars. They will discuss their methods, trading ideas and strategies to the program members. They will also be involved in a lot of discussions to make sure that they are able to connect fully to the club’s members. Since Vladimir has developed software for Trading, it is also fitting to teach the community on how to use trading tools to their advantage. Every time there is a live webinar aside from having a detailed analysis of all the trading strategies and methods you will also receive two detailed reports a day. This will explain everything in detail for the particular lesson and will guide you through the rest of your trading day. You will have access to a selection of Vladimir’s invaluable tools that he prepared over the years. 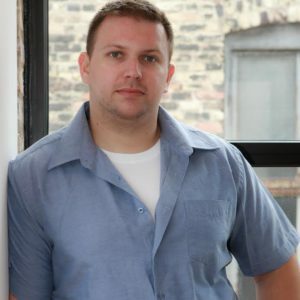 These will include all the tools he has used that can help you in the future for your successful trading business. This is where the live webinars are stored, together with other videos and resources. Members that trade seriously will be referred to other companies to trade with them. If you were able to see all the things that are inside Trades Academy Club, you will be thinking that this will be a hella expensive products, nut Vladimir’s goal is to make this affordable to everyone. Members will only pay $197 a year to gain access to all the service and features of the club. Again as I have said a while ago, the training can be for beginners and experts. They have in-depth training and in-depth resources for their community. From trading basic, to live webinars and room sessions, to guest traders, to trading videos expect that you can get so much out of Vladimir’s program that you can use in the future. For the success of your trading business and your success as well. The best part is it doesn’t cost you a lot. This will only cost you $197 to get access to all the resources and material they have in their club. I have checked all the feedbacks relating to this club and all I can see are positive reviews. And aside from that, there is also a review thru facebook which you can check here. With all these reviews, we can all agree that a lot of people are satisfied with Vladimir’s club. In the business side, Forex Trading is risky. People can lose a lot of money in one trade only. Forex Trading can be unpredictable most of the time that even those who have been in the business for so long are still experiencing some loses. However, we have a Trade Academy Club to help you with Forex Trading. And if you want another all in one platform that will also teach you about getting that passive monthly income like me, you can check my #1 recommendation! I can proudly say that this is not a scam. Vladimir’s background, plus the resources, plus the guest traders, plus all the positive reviews, all I can say is this is a perfect formula for a legitimate business. Is it worth it? YES! All those things that you’ll get for only $197 yearly is a steal. Vladimir was able to provide in-depth and comprehensive training about Forex Trading for an affordable price. I can’t say anything bad about this program. If you are interested in trading, then this is the place to go to.